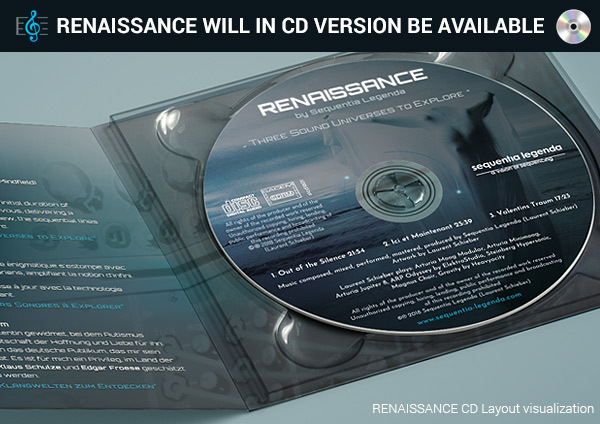 RENAISSANCE - Sequentia Legenda's fifth album. and also in CD Digipack version. The CD pressing will be done in a French company, I am pleased with this news. This album will include three tracks for a total duration of 64 minutes in the purest tradition of the Berlin School. 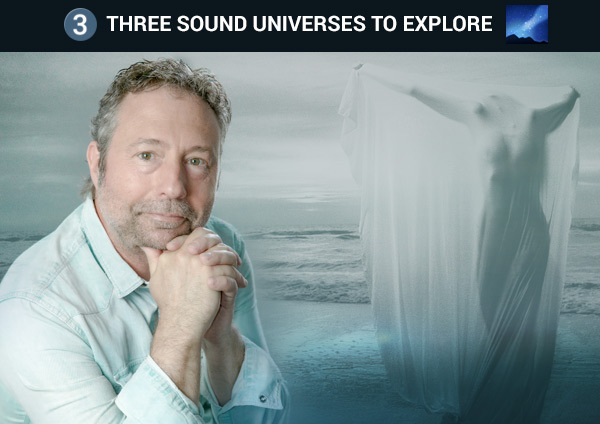 THREE SOUND UNIVERSES TO EXPLORE. 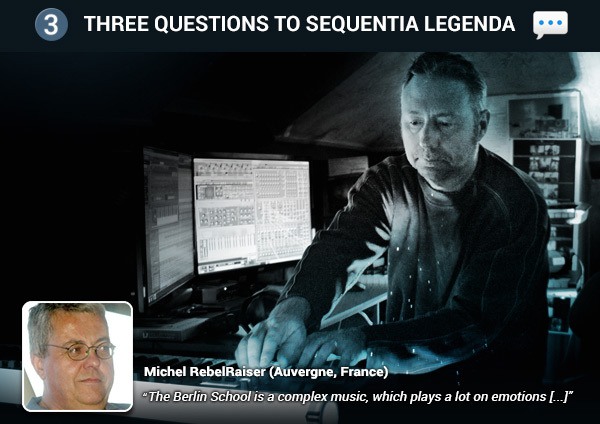 And now THREE QUESTION to Sequentia Legenda. „The title RENAISSANCE would be for you that of the Berlin School! Ici et Maintenant and Valentins Traum. "Nowhere, Now Here" (Body Love II), which we could translate as "Nulle part, içi et maintenant" ! And another "Sebastian in Traum" (Audentity). „It closed to my heart to me to make an album with three tracks in three languages. For the anecdote, the title had undergone a reshuffle. At the base, this one had to be called IMMERSION. After a long discussion, my wife persuaded me and the album received its definitive title: RENAISSANCE. When I was starting the composition that would become Valentins Traum, I had been thinking for some time about a music dedicated to my youngest son Valentin with autism. He's a very courageous little boy, willing and extremely generous. His pathology no longer frightens me, I learned a lot through him! Valentin accompanied me to the first meeting with Tommy Betzler in Darmstadt. Tommy had given him a set of chopsticks. We spend a lot of time together in Germany. I wanted to kill two birds with one stone: a dedication for my son and a tribute to the German public who trusted me. It was in Hamm in the Ruhr that I had the pleasure of performing for the first time on stage with Tommy on drums. It is a great privilege to be able to play in the fiefdom of the Berlin School in the country of Klaus Schulze and the late Edgar Froese. This title is Valentin's dream - our journey through the stars - a message of hope and love. Concerning the track "Ici et Maintenant" I wanted in all simplicity to pay homage to my family, to my friends, to the French musicians, to my homeland. It is important for me to share the present moment with my loved ones and with the listeners. It is also a transposition of music from the analog era to now with today's instruments. „The Berlin School is a complex music, which plays a lot on emotions and which are expressed in duration, while taking care to preserve the constant attention of the listener. 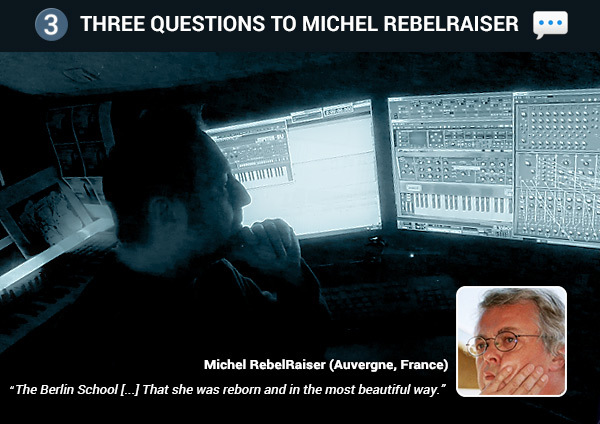 „I don't know if the Berlin School is really complex music, it is for me "natural", I approach it with serenity and simplicity. It comes naturally if I may say. It is sometimes a real call, to which I respond present by dialing instinctively. Work does not frighten me, time has no hold on me when I am in my "creative bubble". I feel it, I live Berlin School and I share it through my music as best I can. As for the length of my tracks, it takes me some time to be able to express myself freely, to place the sound beads along the conductor thread of my musical frame. I need this time to release all my emotions. For the moment, I didn't want to "impose" solos on the listeners so as not to freeze my pieces. On the contrary, I wanted to keep enough space to let my music breathe and live in order to offer a part of creativity when listening. 20 minutes is a good average to immerse the listener in my musical universe. My music requires several listenings to discover and appreciate all of the sound subtleties revealed during the exploration of my sound landscapes. For me, there's not really a "privileged" album, it's always a new adventure, a new experience. Each time you have to be able to sublimate yourself, to renew yourself while remaining to a certain extent in adequacy with the overall style of the Berlin School. Each album has its own story, its own experience. So, I hope I was able to answer your questions, it was a real pleasure. I wish you a good continuation and a full success to your next album, and your future plans. „For me, it is important to know how the listeners feel, it is finally a sharing of emotions and I take this opportunity to learn a little more about it. From a very young age, I have always been attracted to music. But in all its forms. I started young with Tchaikovsky's Concerto for Piano and Orchestra No. 1 at the age of 13. A real love at first sight! After that, growing up, I diversified and told myself that it wasn't ridiculous to love rock and classical music. Two different worlds, but not incompatible. And, driven by an insatiable musical curiosity, I was always looking for new sounds, new things. It was through a magazine that I had heard about a movement, rather curious but terribly innovative, that the English Saxons had baptized with an unflattering nickname, krautrock, literally rock "sauerkraut". All the bands had strange names, Xhol, Limbus, Amon Duul ... And then Ash Ra Tempel, Tangerine Dream and Klaus Schulze, the Berlin School. I wanted to know more... Well, mostly listen. The only problem was that it was all very marginal and it was very difficult to find them in the shops. So, through my favourite record shop, I had them imported directly from Germany. Starting with the Berlin School! The very first one I listened to was Irrlicht de Schulze. What a punch and what a trip! I was flabbergasted and completely transported! From the little material he had at the time, he produced incredible sounds. Huge potential and extraordinary creativity! Then there was Cyborg from the same Klaus who confirmed all the good I could think of it, the first Tangerine Dream, ( Edgar Froese) Atem, Alpha Centauri, Zeit and Ash Ra Tempel( Manuel Gottsching), Schwingungen, Seven Up who definitely sealed this passion between me and this unclassifiable and terribly innovative music. And the krautrock of course! This attraction has never really ceased, just interrupted by other priorities, and not the least, my wife, my daughter! Today, almost fifty years later, I say to myself that it is quite simply incredible to see to what extent this music has left its mark on people's minds. Especially in what way, it will have greatly influenced a whole generation of artists. Finally, it remains a timeless genre. „The Berlin School of the 70s was analogue and quite contemplative. The artists discovered the Moog Synthesizer, this very mysterious instrument. And that fascinated everyone a little. We all remember the success of the global hit "Pop Corn". In 75, with the arrival of the sequencers, Tangerine Dream in particular, it takes another dimension. She's getting more punchy. Confirming in the 80s, with the appearance of digital and MIDI format where it established its popularity... A "dialogue" is established between the artist and his machine. And the Berlin School becomes more "accessible", less cold, more friendly and dynamic. „My own feeling, difficult to describe! First of all, what you need to know is that, in order to appreciate this music, I isolate myself, in the figurative sense of the term of course, but this is in order to immerse myself in the artist's universe... Immerse myself in his musical world! After, depending on the song, notes, sequences, melody, emotions take over. And of all kinds! I remember that Schulze's Ballet 1, and its very strong evocative power, had stung my eyes. But it is essential because, as cold as ice, the Berlin School cannot, could not hang me. And then there are also varied images. Often serene and calm landscapes, rarely threatening or frightening. Lakes, seas, clouds, heavenly forests! Imaginary countries I don't know where they are. But it's very beautiful. After that, I can stay two, three minutes before coming down. And, as you rightly point out, several listening sessions are sometimes necessary to appreciate its richness. „It was very informative and enriching. RENAISSANCE will be my fifth album, a new opus, three new sound landscapes to explore. Three tracks compose this album, I have the pleasure to present you an excerpt of "Out of the Silence". This track will be the opening of RENAISSANCE and the introduction in this new sound universe. Originally, it was at the request of Jean-Luc Briançon (Kurtz Mindfields) for a collaboration that I composed this title. The composition has been rearranged and reorganized from an initial duration of 9:09 to 21:53. The Modular Moog sequences are at the rendezvous, delivering a structure that will be followed by percussion. The finale is totally new, the sequential lines bathed in an airy and immersive atmosphere. I wish you a lot of fun listening to "Out of the Silence". © 2014 - 2018 Sequentia Legenda. Fourni par Blogger.